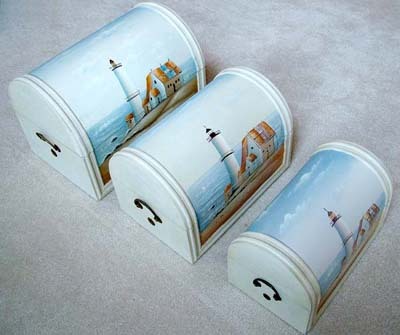 Set of 3 wooden trunks. These three unique trunks are made Hand Crafted from wood with a Beautiful hand-painted finish. Put your valuable into these beautiful trunks. These exclusive artworks will be brightening up your living corners with ever enchanting charm and inspiration. Each smaller size trunk fits into the larger size trunk. Wood, 18.5 inches W. x 13 inches H. x 12.5 inches D.